Here is the list of the hotels near Toulon. Book your hotel near Toulon today, Thursday 16 May for the best price, reservation and cancellation free of charge thanks to our partner Booking.com, leader in on-line hotels reservation. Below here is the list the 50 closest hotels of Toulon, sortable according your criteria. You will find the position of these accommodations on the Toulon hotels map. Hotel Toulon Preferred hotel ! Hôtel Bonaparte is set in the heart of Toulon, a 2-minute walk from the harbor and Toulon Arsenal. Each room has a private bathroom and TV. Free WiFi is available in public areas. Accessed via a staircase, all of the Bonaparte’s rooms have soundproofed windows and flat-screen TVs. Some rooms have a view over Saint-Louis church or the Arsenal. A kettle with tea and coffee is available in the room. A buffet breakfast is available on a morning, which includes pastries, bread, fresh fruit and hot drinks. A vending machine with food and drinks can be found at reception. The Bonaparte is set a 5-minute walk from Toulon Cathedral and close to many of the town’s restaurants and bars. Underground secured public parking open 24/7 is available nearby for an additional charge. Luggage storage is available at reception. Situated in Toulon’s Mourillon district, facing a typical Mediterranean fishing port, Best Western Plus La Corniche is an eco-friendly hotel boasting Ecolabel certification. It overlooks the beach and some of the rooms boast sea views. There is free WiFi access. The guest rooms have flat-screen TVs and private bathrooms. Some rooms also have a balcony. A buffet breakfast is served in the hotel’s panoramic breakfast room or in the garden. A continental breakfast can be served in your room upon request. After a day relaxing at the nearby Mourillon beaches you can enjoy sampling some French wines on the hotel bar’s patio. The friendly staff at the Best Western La Corniche will be happy to help you plan your stay in Toulon 24 hours a day. Maps and tourist information are available at reception. Apartment Toulon Preferred hotel ! Gauchi offers accommodation in Toulon, 1.7 km from Zénith Oméga Toulon and 1.1 km from Toulon Tribunal de Grande Instance - Court House. This property is 1.8 km from Mont Faron Gondola. This apartment features a living room and a fully equipped kitchen with a microwave. A flat-screen TV with cable channels and a Blu-ray player are provided. Staff speak English and French at the 24-hour front desk. ISEN Toulon Engineering School is 2.4 km from the apartment. The nearest airport is Toulon - Hyeres Airport, 25 km from Gauchi. Set 2 km from Zénith Oméga Toulon and 600 metres from Toulon Convention Centre, Appartement ambiance design épuré Cours Lafayette provides accommodation situated in Toulon. It is located 600 metres from Toulon Town Hall and features free WiFi. This apartment comes with a kitchen, a flat-screen TV, a seating area and 1 bathroom with a shower. ISEN Toulon Engineering School is less than 1 km from the apartment, while Toulon Tribunal de Grande Instance - Court House is a 17-minute walk away. The nearest airport is Toulon - Hyeres Airport, 24 km from the property. Appartement Cosy Foch T2 is set in Toulon. Guests staying at this apartment have access to free WiFi. The apartment has 1 bedroom with air conditioning and a fully equipped kitchen with a microwave. The apartment also provides a seating area, washing machine and 1 bathroom with free toiletries. Zénith Oméga Toulon is 1.3 km from Appartement Cosy Foch T2, while Toulon Tribunal de Grande Instance - Court House is 200 metres from the property. The nearest airport is Toulon - Hyeres Airport, 25 km from the property. Located in Toulon, within 2.5 km of Zénith Oméga Toulon, Le Duplex is an accommodation offering city views. The accommodation is 300 metres from Toulon Town Hall. The apartment features 1 separate bedroom, 1 bathroom, a fully equipped kitchen with a dining area and microwave, and a living room with a flat-screen TV. Toulon Convention Centre is 800 metres from the apartment, while ISEN Toulon Engineering School is 1.2 km from the property. The nearest airport is Toulon - Hyeres Airport, 24 km from the property. Great 1 bedroom Downtown - Dodo et Tartine in Toulon features accommodation with free WiFi, 1.9 km from Zénith Oméga Toulon and 800 metres from Toulon Town Hall. Guests staying at this apartment have access to a fully equipped kitchen. The apartment includes 1 bedroom and a living room with a flat-screen TV. Toulon Tribunal de Grande Instance - Court House is less than 1 km from the apartment, while ISEN Toulon Engineering School is an 18-minute walk away. Toulon - Hyeres Airport is 25 km from the property. Located 2.5 km from Zénith Oméga Toulon, 800 metres from Toulon Town Hall and 1.2 km from ISEN Toulon Engineering School, Port de Toulon / Stade Mayol offers accommodation set in Toulon. Housed in a building dating from 1900, this apartment is 1.5 km from Toulon Convention Centre and 2.3 km from Toulon Tribunal de Grande Instance - Court House. The apartment is fitted with 1 bedroom, a flat-screen TV with cable channels and a fully equipped kitchen that provides guests with a dishwasher, an oven, and a washing machine. Private parking is available at the apartment. Mont Faron Gondola is 3.1 km from Port de Toulon / Stade Mayol. The nearest airport is Toulon - Hyeres Airport, 24 km from the accommodation. Grand Hotel Dauphiné is located in Toulon town centre, 500 metres from Toulon Train Station and 700 metres from Mayol Stadium. It offers contemporary-style rooms equipped with soundproofing, air conditioning and free WiFi. Additional facilities in the rooms at this hotel include a TV with Canal+ satellite channels. The Dauphine provides a 24-hour reception. Grand Hotel is a 10-minute walk from the port, where guests can enjoy a boat ride to Les Sablettes and Porquerolles Island. Secure parking is also available at an extra cost, 50 metres from the hotel. 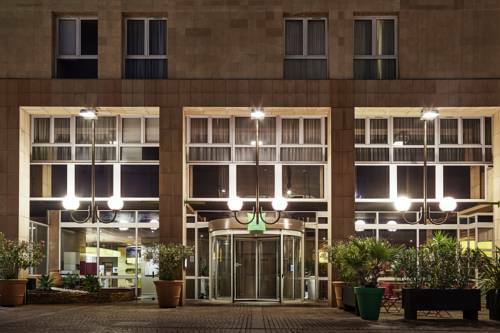 This Holiday Inn Toulon City Centre hotel is a 10-minute walk from Place de la Liberté and a 5-minute walk from Toulon Train Station. It has an outdoor swimming pool, a furnished terrace and a fitness room. It also offers a bar and restaurant. A flat-screen TV with cable channels, air conditioning and free Wi-Fi access are provided in each guest room. A welcome tray and a tea and coffee maker allow guests to enjoy a hot drink and snacks in their room. A safety deposit box and a trouser press are also provided. The hotel’s restaurant, L'Observatoire, offers French cuisine including regional Provencal dishes. Guests can enjoy a drink in the hotel bar, L’Escale, or on the terrace overlooking the pool. Holiday Inn Toulon City Centre is 800 metres from the Zenith Omega Exhibition Centre. Toulon harbour is 10 minutes by car and provides ferry connections to Corsica. Au Nouvel Hotel offers accommodation in Toulon, just 150 metres from the train station and 800 metres from the port. Free WiFi is available throughout the hotel. Each room is soundproofed and equipped with a TV and en suite bathroom with a shower or bathtub. The rooms are accessible by lift. Au Nouvel Hotel is an ideal base for exploring Toulon. It is located a 5-minute walk from Parc des Lices and a 10-minute walk from Toulon Cathedral, which was completed in the 18th-century. This hotel is located on the Place de la Liberté, in the heart of Toulon, 300 metres from Toulon Train Station. It offers free Wi-Fi in public areas and individually decorated rooms. At the Celenya Hôtel there is an international theme to the decor, with rooms on each floor reflecting the style of a different continent. The air-conditioned rooms are equipped with TV and a private bathroom with hairdryers on request at reception. After a busy day sightseeing guests can relax back at the hotel lounge, and enjoy a drink. A buffet breakfast is served daily, in the breakfast room or in guest’s room. The Hôtel Celenya has a 24-hours front desk and staff can assist in the organisation of guests travels in Toulon. It is 650 metres to Military Port of Toulon and the Mediterranean Sea and 550 metres from Parc des Lices. Set within 2.5 km of Zénith Oméga Toulon and a few steps of Toulon Convention Centre in Toulon, Neoresid - Résidence Mayol provides accommodation with free WiFi and a kitchenette. The apartment offers a flat-screen TV and a private bathroom with free toiletries, a hair dryer and shower. A microwave is also available, as well as a coffee machine and a kettle. Neoresid - Résidence Mayol offers a sun terrace. Guests can relax in the garden at the property. Toulon Town Hall is 400 metres from the accommodation, while ISEN Toulon Engineering School is 1.3 km away. The nearest airport is Toulon - Hyeres Airport, 24 km from Neoresid - Résidence Mayol. Situated in the city centre of Toulon, 400 metres from the train station and 200 metres from the famous Place d'Armes, this small hotel offers well-equipped rooms with free WiFi internet access. It is just 1.5 km from the ferry port. The rooms come with a private bathroom with shower. Guests can enjoy breakfast in the comfort of their rooms. They can also use a laptop on site, at an extra charge. Hôtel Jaures benefits from a privileged location in the Var department and it offers a great starting point to discover this lovely South-East region of France. Toulon Appartement Las Fanyseb offers accommodation in a lively area of Toulon, 1 km from the sea. The property features views of the mountain and is 1.4 km from Zénith Oméga Toulon. Free WiFi is featured throughout the property. A dishwasher and an oven can be found in the kitchen. Towels and bed linen are available in this self-catering accommodation. Towels and a baby kit are available upon request for free. Guests can find shops and restaurants nearby. A Provençal market is available every morning from Tuesday to Sunday 50 metres from the proeprty. Toulon Tribunal de Grande Instance - Court House is 900 metres from Toulon Appartement Las Fanyseb, while Toulon Town Hall is 1.7 km from the property. The Mourillon beach is 4 km away from the property. Toulon Train Station is 1.3 km from the apartment. The nearest airport is Toulon - Hyeres Airport, 19 km away. Sci St Helene offers accommodation in Toulon, 600 metres from Zénith Oméga Toulon. Sci St Helene features views of the sea and is 500 metres from Toulon Tribunal de Grande Instance - Court House. There is a seating area, a dining area and a kitchen complete with a dishwasher, an oven and a microwave. A flat-screen TV with satellite channels is provided. There is a private bathroom with a bath. Bed linen and towels are provided. Mont Faron Gondola is 1 km from Sci St Helene, while Toulon Town Hall is 1.2 km from the property. The nearest airport is Toulon - Hyeres Airport, 18 km from Sci St Helene. Little Palace is located in the centre of Toulon, just 400 metres from the city’s port and the Mediterranean Sea. Free Wi-Fi internet access is provided in the air-conditioned hotel. The guest rooms at Little Palace include a flat-screen TV, a telephone and a work desk. The soundproofed rooms each feature a wardrobe and an en suite bathroom with a shower. A buffet-style breakfast is served every morning and bars and restaurants are found within 100 metres of the property. Mayol shopping centre is 1 km away. Toulon Train Station is 1 km from the hotel and the Toulon Opera is just 180 metres away. The property is 260 metres from Cathédrale Saint-Marie and 24 km from Toulon-Hyères Airport. Le Mourillon Appartement -Terrasse offers accommodation in Toulon, 1.8 km from Zénith Oméga Toulon. The apartment is 900 metres from ISEN Toulon Engineering School. Free WiFi is offered throughout the property. The kitchen is fitted with a dishwasher. Towels and bed linen are provided in this self-catering accommodation. There is a private bathroom with a shower. The apartment features a 30 metres² private furnished terrace. You can play tennis at the property, and the area is popular for windsurfing. Toulon Convention Centre is 900 metres from Le Mourillon Appartement -Terrasse, while Toulon Town Hall is 1 km away. The nearest airport is Toulon - Hyeres Airport, 17 km from the property. Located within less than 1 km of Zénith Oméga Toulon and a 9-minute walk of Mont Faron Gondola in Toulon, Au Pied Du Mont Faron features accommodation with free WiFi. All units feature a fully equipped kitchen with coffee machine, a living room with a flat-screen TV and private bathroom with free toiletries and a bath or shower. Some units have a dining area and/or a terrace. Toulon Tribunal de Grande Instance - Court House is 1.4 km from the apartment. Toulon - Hyeres Airport is 25 km from the property. Situated in Toulon, Luxueux Loft features free WiFi. The apartment is 50 metres from the marina and the jetty where you can take a boat to the Sablettes Beach. It is a 5-minute drive from Mourion Beach, and 250 metres from Mayol Mall. A dishwasher and an oven can be found in the kitchen. A flat-screen TV is provided. Toulon Town Hall is 100 metres from Luxueux Loft, while Toulon Convention Centre is 400 metres from the property. Toulon - Hyeres Airport is 18 km away. L'Appartement du Port is set in Toulon, 2.3 km from Zénith Oméga Toulon, 300 metres from Toulon Town Hall, and less than 1 km from Toulon Convention Centre. The accommodation is a 14-minute walk from the ISEN Toulon Engineering School. The provided apartment features 1 bedroom, a living room, a kitchen, a dining area, and 1 bathroom with a shower. A flat-screen TV is provided. Toulon Tribunal de Grande Instance - Court House is 1.7 km from the apartment. Toulon - Hyeres Airport is 24 km away. Hôtel Amirauté is situated in the centre of Toulon, near Place de la Liberté and the harbour. It offers free Wi-Fi access and air-conditioned accommodation equipped with a satellite TV. Guest rooms at the Amiraute have a work desk and a fixed phone line with free calls to 18 destinations, including the USA, the United Kingdom, China and Canada. A full breakfast buffet is served each morning at the Hôtel Amiraute. The hotel also provides a 24-hour reception. Located 2.1 km from Zénith Oméga Toulon and 90 metres from Toulon Town Hall, R.I.O. PASSIONS features accommodation in Toulon. Complimentary WiFi is featured. Units are fitted with a flat-screen TV, a kitchen with a dining area, and a private bathroom. A dishwasher and coffee machine are also available. Popular points of interest near the apartment include Toulon Convention Centre, Toulon Tribunal de Grande Instance - Court House and ISEN Toulon Engineering School. Toulon - Hyeres Airport is 24 km from the property. Villa le 180 cinq is situated in the Aiguillon district of Toulon City, 2 km from the marina. This self-catering accommodation features mountain views and free WiFi access. This villa has 4 bedrooms, each with a flat-screen TV. The bathroom comes with a shower. There is a kitchen with dining table, a washing machine and ironing facilities. Restaurants, bars and shops can be found a 5-minute walk away. Toulon Train Station is a 6-minute drive away and the centre of the city and Mourillon Beach are both a 20-minute walk away. The property is 22 km from Toulon Airport. One parking space for disabled guests is available in the street in front of the villa. Located in Toulon, Ibis Styles Toulon Centre Port hotel is a 5-minute walk to the harbour and old town. It offers a terrace and provides a continental breakfast. The air-conditioned guest rooms feature satellite TV and modern en suite facilities. All guest rooms are serviced by a lift at Ibis Styles Toulon Centre Port. Traditional French cuisine is served in the restaurant and guests can enjoy a drink in the hotel bar. Free coffee and tea is provided in the welcome space. The hotel is located opposite the Neptune Congress Centre and the famous Mayol Rugby Stadium is a 3-minute walk away. Paid public parking is available nearby. Featuring free WiFi throughout, Le Jardin de Tesse Chambre d'hôtes is situated in Toulon, 200 metres from Zénith Oméga Toulon. This B&B offers two guest rooms and access to a shared garden with the owners and a covered, seasonal swimming pool. The air-conditioned guest rooms have a flat-screen TV. For your comfort, you will also find a private bathroom with bathrobes and free toiletries. Breakfast is available every morning and includes homemade jams, yoghurts, hot drinks, fresh breads and pastries. Toulon Town Hall is 600 metres from Le Jardin de Tesse Chambre d'hôtes, while Toulon Port is a 10-minute walk away. Toulon Train and Bus Stations are both within 500 metres of the property. The nearest airport is Toulon - Hyeres Airport, 17 km from the property. T1 Toulon Opera offers pet-friendly accommodation in the historical centre of Toulon, 500 metres from Zénith Oméga Toulon. The property features views of the city and is 300 metres from Toulon Town Hall. Free WiFi is offered throughout the property. There is a dining area and a kitchen complete with a microwave and a fridge. A flat-screen TV with cable channels is available. T1 Toulon Opera is a 2-minute walk from the nearest bus stop and a 5-minute bus ride from the beach. Toulon Convention Centre is 500 metres from T1 Toulon Opera, while ISEN Toulon Engineering School is 600 metres from the property. The port of Toulon is 350 metres from the property, while the Toulon Opera is 180 metres away. The nearest airport is Toulon - Hyeres Airport, 18 km from T1 Toulon Opera. Located 2.4 km from Zénith Oméga Toulon and 300 metres from Toulon Town Hall, Résidences Les Bonnetières provides accommodation in Toulon. Free WiFi is featured. All of the units feature a private bathroom, flat-screen TV and fully-equipped kitchen. A microwave and fridge are also available, as well as a coffee machine. Toulon Convention Centre is less than 1 km from the apartment. The nearest airport is Toulon - Hyeres Airport, 24 km from the property. Smile-appartment is an apartment situated in Toulon, 600 metres from Zénith Oméga Toulon. The apartment is 300 metres from the Toulon Town Hall. Free WiFi is offered. Public parking is available nearby. The kitchenette is equipped with a microwave. Towels and bed linen are available for an extra cost. The Toulon Convention Centre is 500 metres from Smile-appartment, while the Toulon Tribunal de Grande Instance - Court House is 600 metres from the property. The nearest airport is Toulon - Hyeres Airport, 18 km from Smile-appartment. Offering free WiFi, Bed&Breakfast au bord de mer is a B&B located in Toulon, 2 minutes' walk from Mourillon Beach. The guests' area is independent and includes the bedroom, the bathroom and the toilet. Guests can take a bus, 100 metres from the property, to go to Toulon’s city centre and the port. Located on the ground floor, the air-conditioned double room will provide you with a flat-screen TV and a free-use computer. The private bathroom comes with a hairdryer and free toiletries. A continental breakfast is served every morning in the dining room. A number of restaurants can be found just 200 metres from the property. If you feel like visiting the surroundings, check out Zénith Oméga Toulon, and Toulon Train Station, both 3 km away. Marseille Provence Airport is 90 km away. Ferries to Corsica can be taken 3 minutes' drive away. One secured and private parking space is provided. Offering a sun terrace and views of the garden, Maison de Pêcheur is a guest house set in Toulon, 2.2 km from Zénith Oméga Toulon. Free private parking is available on site. The rooms include a flat-screen TV with cable channels. You will find a kettle in the room. All rooms are fitted with a private bathroom. For your comfort, you will find bathrobes, free toiletries and a hairdryer. The guest house also offers free use of bicycles. Toulon Convention Centre is 1.3 km from Maison de Pêcheur, while Toulon Town Hall is 1.4 km away. The nearest airport is Toulon - Hyeres Airport, 17 km from Maison de Pêcheur. Set in the historical centre of Toulon, this studio is 60 metres from Les Halles Municipales and 600 metres from Zénith Oméga Toulon. The property boasts views of the city and is 300 metres from Toulon Town Hall. This soundproof studio has a private bathroom with a shower and a toilet. The kitchenette is fitted with an oven and a microwave, as well as a coffee machine and a kettle. A flat-screen TV with cable channels and a washing machine are offered. You can find a Provençal market and a shopping centre in the area. The property is a 5-minute bus ride from the beach. Toulon Convention Centre is 300 metres from Studio Toulon les Halles, while ISEN Toulon Engineering School is 400 metres from the property. Toulon - Hyeres Airport is 17 km away. Ibis budget Toulon centre is situated in central Toulon, just a 1-minute walk from the port and from the Mediterranean Sea. The hotel offers free Wi-Fi internet access and a24-hour reception. The guest rooms at Ibis budget Toulon centre are simply decorated and include a TV. They each feature a private bathroom with a bathtub or a shower. A continental breakfast can be enjoyed every morning at the Ibis budget Toulon centre, and newspapers are available free of charge. The nearest beach is 2.5 km from the hotel and Toulon Train Station is a 7-minute drive away. The property is 23 km from Toulon-Hyeres Airport. Located in the heart of Toulon, Hotel The Originals Toulon Grand Hôtel de la Gare is opposite the train and bus stations, just a 2-minute walk from the Place de la Liberté. It offers rooms with free WiFi access. Hotel The Originals Toulon Grand Hôtel de la Gare offers soundproofed rooms with air conditioning and satellite TV, including Canal+ channels. All rooms are serviced by a lift. A full breakfast buffet is served daily with organic produce including biscuits, honey, tea, syrups and fresh fruits. Hotel The Originals Toulon Grand Hôtel de la Gare is less than a 5-minute walk from Oméga Zenith concert hall. The Mayol Stadium is 1 km away and the Palais des Sports is 1.5 km from the hotel. The ports are 1 km away. Riaux83 offers accommodation in Toulon, 2.3 km from Zénith Oméga Toulon and 400 metres from Toulon Town Hall. This property is 800 metres from Toulon Convention Centre and features free WiFi. This apartment comes with a living room and a fully equipped kitchenette with an oven. The property also has 1 bathroom with a bath. ISEN Toulon Engineering School is 1.1 km from the apartment, while Toulon Tribunal de Grande Instance - Court House is 1.7 km from the property. The nearest airport is Toulon - Hyeres Airport, 24 km from the property. Located in Toulon, Lacordaire Saint-Roch offers self-catering accommodation with free WiFi. The property features views of the mountain and is 1.3 km from Zénith Oméga Toulon. The kitchenette has a microwave, a toaster and a fridge, as well as a coffee machine and a kettle. A flat-screen TV is available. Toulon Tribunal de Grande Instance - Court House is 1 km from Lacordaire Saint-Roch, while Mont Faron Gondola is 1.5 km away. The area is popular for snorkelling and fishing. Toulon - Hyeres Airport is 19 km from the property. Free on-street parking is available. Located in Toulon, 1.2 km from Zénith Oméga Toulon and 600 metres from Toulon Tribunal de Grande Instance - Court House, Toulon Plage provides accommodation with free WiFi, air conditioning and a terrace. The property has city views and is 1.9 km from Toulon Town Hall. The apartment features a balcony, 2 bedrooms, a living room and a well-equipped kitchen. A flat-screen TV with cable channels is available. ISEN Toulon Engineering School is 1.9 km from the apartment. The nearest airport is Toulon - Hyeres Airport, 25 km from the property. Amazing Quiet Studio Downtown - Dodo et Tartine in Toulon features accommodation with free WiFi, 1.9 km from Zénith Oméga Toulon. The accommodation is 800 metres from the Toulon Town Hall. The apartment comes with 1 bedroom, a flat-screen TV with cable channels and a fully equipped kitchen that provides guests with an oven. Toulon Tribunal de Grande Instance - Court House is less than 1 km from the apartment, while ISEN Toulon Engineering School is an 18-minute walk away. The nearest airport is Toulon - Hyeres Airport, 25 km from the property. Set in Toulon, within 2.1 km of Zénith Oméga Toulon, Les IBIS is an accommodation offering city views. The property is less than 1 km from ISEN Toulon Engineering School. This 1-bedroom apartment comes with a kitchen, a seating area, a dining area and a satellite flat-screen TV. Toulon Town Hall is a 13-minute walk from the apartment, while Toulon Convention Centre is 1.2 km away. The nearest airport is Toulon - Hyeres Airport, 23 km from Les IBIS. Set 1.9 km from Zénith Oméga Toulon and 700 metres from Toulon Town Hall in Toulon, Peaceful 1 bedroom downtown - Dodo et Tartine offers accommodation with a kitchen. The property has city views and is less than 1 km from Toulon Tribunal de Grande Instance - Court House and an 18-minute walk from ISEN Toulon Engineering School. The apartment includes 1 bedroom and a living room with a flat-screen TV. Toulon Convention Centre is 1.5 km from the apartment, while Mont Faron Gondola is 2.7 km from the property. The nearest airport is Toulon - Hyeres Airport, 25 km from Peaceful 1 bedroom downtown. Appartement la Glacière offers accommodation in Toulon, 2 km from Zénith Oméga Toulon and 800 metres from Toulon Town Hall. This apartment is less than 1 km from Toulon Tribunal de Grande Instance - Court House. This apartment is fitted with 3 bedrooms, a cable flat-screen TV, a dining area, and a kitchen with a dishwasher and an oven. ISEN Toulon Engineering School is an 18-minute walk from the apartment, while Toulon Convention Centre is 1.5 km from the property. Toulon - Hyeres Airport is 25 km away. Loramac/views of the city and shops and restaurants can be found less than 50 metres away. The property is 450 metres from Palais Neptune Congress Centre and 3 km from Mourillon Beach. The one-bedroom apartment is located on the 4th floor and is only accessible by stairs. It comes with a kitchenette equipped with an oven, a coffee machine, an electric kettle and a toaster. The living area features a sofa bed. There is a shower room with a toilet. Cleaning products are provided. A selection of activities are offered in the area, such as fishing and hiking. The property is a 10-minute walk from Toulon Train Station. The nearest airport is Toulon - Hyeres Airport, 22 km from Loramac/Alezard. Studio bleu is located in Toulon, 600 metres from Zénith Oméga Toulon, a 3-minute walk from Toulon Town Hall, and 400 metres from Toulon Convention Centre. The property is 600 metres from ISEN Toulon Engineering School. This apartment includes a living room and a flat-screen TV, an equipped kitchenette with a dining area, and a bathroom with a shower. Private parking is available at the apartment. Toulon Tribunal de Grande Instance - Court House is 700 metres from studio bleu, while Mont Faron Gondola is 1.6 km away. The nearest airport is Toulon - Hyeres Airport, 18 km from the accommodation. Appartement Toulon offers accommodation in Toulon, 600 metres from Zénith Oméga Toulon and 300 metres from Toulon Town Hall. The apartment is 500 metres from Toulon Tribunal de Grande Instance - Court House. Free WiFi is featured throughout the property. There is a seating area, a dining area and a kitchenette. A flat-screen TV is offered. Toulon Convention Centre is 500 metres from Appartement Toulon, while ISEN Toulon Engineering School is 700 metres away. Toulon - Hyeres Airport is 18 km from the property. Public parking is available nearby, at an extra cost. Les Ibis offers self-catering accommodation in Toulon, 600 metres from Toulon Port and from Mayol shopping mall. This apartment features a balcony with views of the city and the sea. This air-conditioned accommodation offers a seating area with a TV and a full kitchen with a dishwasher and a microwave. The bathroom has a shower and comes with a hairdryer. Restaurants, bars and shops can be found within 700 metres from the property. Les Ibis is 900 metres from Sainte-Marie-de-la-Seds Cathedral, 1 km from Toulon Opera and 1.5 km from the beach. Free parking is available on site. Le Gambetta is situated in Toulon and offers a terrace. Housed in a building dating from 1959, this apartment is 1.9 km from the Zénith Oméga Toulon and provides free WiFi. The apartment includes 1 bedroom, a kitchen with an oven and a microwave, as well as a coffee machine. A flat-screen TV is offered. Both a bicycle rental service and a car rental service are available at the apartment, while fishing and hiking can be enjoyed nearby. Toulon Town Hall is 700 metres from Le Gambetta, while Toulon Tribunal de Grande Instance - Court House is less than 1 km from the property. The nearest airport is Toulon - Hyeres Airport, 25 km from the accommodation. Featuring city views, Studio Rue Lieutenant-Parachutiste Gerard Davet is situated in Toulon, 3.1 km from Zénith Oméga Toulon. The property is 1.5 km from Toulon Town Hall. The apartment comes with a satellite TV. The accommodation is equipped with a kitchen with an oven and a microwave. ISEN Toulon Engineering School is 1.9 km from the apartment, while Toulon Convention Centre is 2.2 km from the property. The nearest airport is Toulon - Hyeres Airport, 24 km from the property. Studio avec vue enjoys a location in Toulon, just 3.4 km from Zénith Oméga Toulon and 1.7 km from Toulon Town Hall. Guests staying at this apartment have access to a fully equipped kitchenette. Composed of 1 bedroom and 1 bathroom, this apartment is equipped with a flat-screen TV. ISEN Toulon Engineering School is 2.1 km from the apartment, while Toulon Convention Centre is 2.4 km away. The nearest airport is Toulon - Hyeres Airport, 24 km from Studio avec vue. Located in Toulon, 2 km from Zénith Oméga Toulon and 400 metres from ISEN Toulon Engineering School, Apartment Toulon I offers free WiFi. The property is 700 metres from Toulon Convention Centre. This apartment is fitted with a living room and a fully equipped kitchen with a microwave. A TV is featured. Toulon Town Hall is 1.1 km from the apartment, while Toulon Tribunal de Grande Instance - Court House is 1.9 km away. The nearest airport is Toulon - Hyeres Airport, 23 km from the property. Below here is the hotels map of Toulon. Names and details of Toulon hotels can be shown on the map clicking on the prices icons.